Only one of the bundle files would be loaded, depending on which route the user takes to get to the site. This file would then lazily load the other modules, as needed, without loading its own. So if the user were to come in through a product, they would load bundle-product.js, which would boot up the page and then would only fetch home.js, category.js and checkout.js if needed. This solution loads all the necessary code for executing the user’s immediate request while only loading the rest if needed. And while it involves having the same code in multiple files, the user should really only download one version of each module as they navigate through the site. There’s a myth that webpack is hard to use and takes a ton of configuration to get anywhere. I haven’t been using it for long enough to know if that was ever the case, but it turns out that webpack is actually quite easy to use nowadays! If you’re familiar with ES modules, static imports and dynamic imports, you’re pretty much all set to build some complex apps with good loading practices and without much in the way of configuration. The above results in a single bundle.js file (or whatever you chose to name it) with all the code. The above results in a bundle.js file with some lazy-loading magic, and a 0.js file with the code for Foo. 0.js is called a “chunk” in webpack terminology, designed to be lazily loaded by other webpack code, and not directly handled by your own code. Alright, so it sounds like you’re all set! You can write standardized module code, which will work both natively in the browser (if your browser already has rolled out support), or through some bundling magic in webpack. So let’s write some code and see what this actually looks like. I’ll circle back to the original example and use the routes for Home, Category, Product and Checkout, as well as a corresponding entry point for each one. Each entry point file would then load its respective module statically, and the others dynamically. In order to avoid tons of code duplication, you’ll need to come up with a simple, consistent interface for exposing everything else. Here’s an example one which I’m calling Router. But if all four modules are being lazily loaded, how do you avoid duplicating the code in the entry point? Surely one of those needs to be null? Home is loaded statically, so that it’s immediately available and doesn’t require waiting for a lazy load. The router is loaded statically, too. Once you make a request to the router, it checks to see if that module is already loaded, either statically or dynamically at some point. If it has been loaded, the promise resolves immediately. If it hasn’t, it fetches the file, loads the code, and continues the promise chain after that. This means that all modules can be used the exact same way, whether by the entry module or, if this were a real application with proper URL routing, by the router itself. So how do I get this to work in webpack? As I mentioned before, all of this should work natively on the browser with no changes, if your browser supports ES modules and ES module loading. You won’t get the performance benefits of bundling without some further work, but the code is still functional. The numeric files include a module each, wrapped in JSONP. The bundle files each have the code for that entry point, bundled together with the router code and some webpack methods that handle the lazy loading. 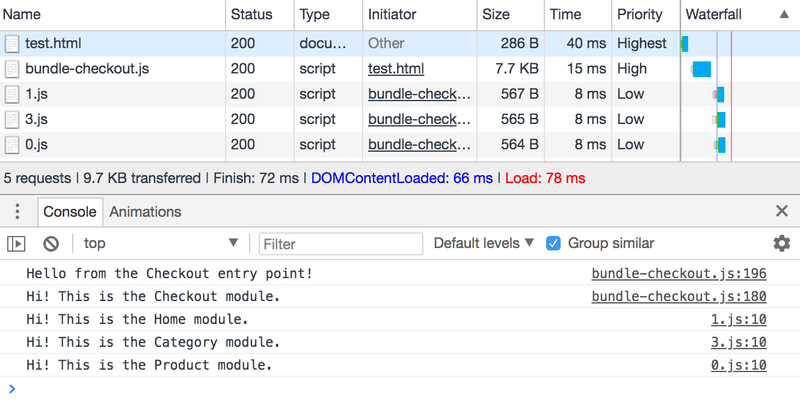 If you load bundle-checkout.js in a test page and look at Chrome Developer Tools, you can confirm that only three chunks get loaded, as expected. You can also see that the message from the Checkout module is coming from bundle-checkout.js, meaning that the Checkout module got bundled into that file. Note that this example is pretty simple, and a real-world application would have further requirements and complexities, such as the need to use the CommonsChunkPlugin for more easily splitting out shared bits of code, or perhaps some potential complexities introduced by using NPM modules as dependencies. These would likely require some extra work on your webpack config. That said, I felt this was an interesting problem and a decent enough solution to share, so I hope you find it useful and it at least serves as a starting point! Special thanks to Surma and Sam Dutton for reviewing this article, pointing out some issues, and helping me figure out a cleaner solution! I’m Sérgio, and I work with Web frontend code. Sometimes I write about it here. Articles under Creative Commons 4.0 Attribution, code under Apache 2.0 (unless otherwise indicated).